Like every thing else about Ascension Island, even getting there is a unique experience. There are two or three flights a week by RAF Tristar from Brize Norton which goes to Ascension and then on to the Falklands. This does have the advantage that one's car is going to be very safe. Checking in was relatively straight forward in spite of the fact that our hand luggage included a substantial number of tents and other things for the island scout troop. It could have been worse at one time it looked like we were going to have been taking a Suzuki jeep engine as hand luggage. Once checked in, there is a "cosy" departure lounge and if one is really lucky the NAAFI refreshment facility is open. The announcements are a bit unlike normal airport ones including such items as "service personnel are reminded that they are not allowed to take alcoholic drinks into the Falklands". Then there is usual security check in spite of being a RAF flight. Finally one is in the departure lounge with a big glass wall and can see the luggage being put aboard. In our case, we also saw it being taken off again , as due to "turbulence" (strong winds to normal folk) the RAF decided to delay the flight by not one or two hours but a whole 24 hours. So one day late we finally took off, and flew over Brittany and Portugal and then all around the coast of Africa to arrive some 8 hours later on Ascension Island just in time to see the sun-rise. Ascension Island is an island of strange contrasts in just about every aspect. Cross Hill. The geology, ecology, history are all tied in with its remote location in the South Atlantic ocean. The Island is one of the few places on Earth where no-one lives permanently. In fact the only permanent inhabitants of any size are the feral cats and sheep, and the land crabs. Currently people either work on the island or are somehow related to someone who works there. There was no tourism at the time of our visit, but the island is no longer "closed" and is now welcoming visitors. So how did we get to visit? The answer lies with one Johnny Hobson MBE, shown in the picture on the right. 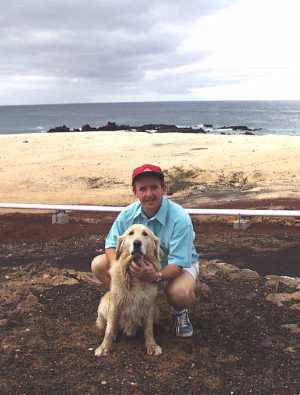 Also in the picture is Paddy who grow up with us as a puppy prior to traveling to Ascension by sea. Johnny is the island dentist and accommodation manager, who is Lynda's Smith's brother. The MBE was presented for Johnny's contribution to scouting, in particular the Islands scout group. After many years of being Johnny's Brize Norton annex it was time for us to savour the Ascension Island experience. One arrives on Ascension just after dawn but as the airport is on one of the few bits of flat land it is another half hour before the sun peeks over one of the surrounding hills. In fact, one feels as it the airport is in a converted colliery hemmed in on three sides by slag heaps. The drive from the airport to Georgetown is less ten minutes, but the scenery is more appropriate to Mars or the moon than an equatorial island. Which is hardly surprising since Ascension was the place where the Lunar Rover was tested by Nasa before going to the moon On the human front, the most noticeable aspect is that all car drivers give each other a passing wave. Later in the week, doing the wave whilst driving a long wheelbase Land Rover, without power steering, and going round a corner, was seen to be something that the locals make look deceptively easy! Originally called Garrison by the Victorian Marines, Georgetown is home to most of the Island's public buildings. The building on the left started life as the the marine barracks and was built in 1832. The upper floor and the clock tower were added later. It is currently the "Exiles Club". To the right is Saint Mary's Church. This was built by the Marines in 1843. During our stay there was a wedding and the entrance door (facing away from the picture) was transformed into a blaze of colour by a vast quantity for freshly picked flowers. The top of green mountain is very green with bamboo, banana trees, eucalyptus, and wild ginger growing in wild abandon. Indeed the paths near the top have to be regularly visited with a team armed with machetes to keep them clear. In the foreground of this picture can be seen some of the 44 volcanic peaks which the island has spread over its 35 square miles. Although no-one can be quite sure, the last eruption may have occurred in the last 500-700 year and one wag's story has it that Ascension was discovered as soon as it was cool enough to land on. It is likely that Ascension is dormant rather than extinct, given the 1961 eruption at Tristan da Cuhna which, like Ascension, is located on the mid-Atlantic ridge. But don't panic !! On volcanic islands eruptions are usually preceded by minor earth tremors. Comfortless Cove is believed to have been used as a quarantine station as early as 1830 when the ex-slaver "Black Jack" arrived with a fever stricken crew. The Bonetta cemetery is situated just behind the cove and dates back to 1838 and is named after the H.M.S. which arrived with cases of yellow fever, and was quarantined at Comfortless Cove. "Broken Tooth" as viewed from Dampier's Drip half way to the summit of green Mountain. This view would not have contained these trees or much of the vegetation in 1815 when the marines arrived. Early accounts of the island refer to the verdant upper slopes of Green Mountain which was probably indigenous vegetation. However there are now many introductions that have "escaped" to the wild including Psidium(Guaver) which was introduced prior to 1859, but is now widespread. In some parts of the island there are little groups of Norfolk pines, which are said to have been planted as a stand by supply of wood to replace broken masts of sailing ships. Sometime during the sixties or seventies someone introduced a Mexican thorn bush (Mesquite), possibly for their garden. This is now out of control in the wild and threatens to take over big areas of the island. A beetle is to be introduced which eats the Mesquite seeds, and the existing trees will be controlled by cutting down etc. The island has feral donkeys, cats and sheep. The feral donkeys were originally introduced for farm work and also for carrying water barrels from Dampier's drip to back down to Georgetown, prior to the building of the pipeline by the Royal Marines in 1830. There are probably between 50 and 100 of these donkeys still roaming the island. If one of them starts braying outside one's window in the early hours it is quite a shock to the system !! The cats were first brought to the island sometime between 1815 and 1820 to control the ship's rats which had been accidentally introduced to the island. However some cats soon escaped with predictable results on the island's bird population who the cats found to be a much easier food source than the rat, particularly in the breeding colonies. Periodic culls of the cats take place but they are still a problem to this day. (In 2001 the FCO announced a £500,000 grant for the eradication of the cats). Also found on the island are land crabs (Gecarcinus lagostoma). In theory these are meant to return to the sea to breed, but the Ascension Island variant seem to do this at very irregular intervals. They can be found on the island quite a distance from the sea and at an altitude of over 1000 feet, just like the one on the right, which was spotted by the side of the road on the way to the old Nasa tracking station. Feral goats also used to be present on the island, but they were all wiped out during the second world war as they was used for target practice. They were probably introduced by one of the first visitors to the island as a source of fresh meat, and also, it is rumoured as an indicator of the presence of fresh water if they survived. The island is also home for a small part of the year to the itinerant Sooty Tern (also know as "Wideawake" tern). They spend most of their time at sea wandering far afield searching for small fish and fry, but unlike most birds they breed every 10 lunar months, and returning to the island in their thousands to nest on the "fairs" between Mars Bay and Pillar Bay. Ascension was to become very important as both as source of intelligence using HF/DF on a site behind Long Beach and also as a staging post for transatlantic flights once the airfield had been build in 1942. The island had 4000 service men stationed there at its peak and these were mainly American. Taking pictures and sketches was banned due to the secrecy surrounding the use of the island as a base, but an island newspaper was published at irregular intervals, and Clarence Douglass, who was there during 42/43 has provided some newspaper extracts. This books cover's Ben Fogle's travels to various South Atlantic islands and some more besides. Union Jacks and red post boxes can still be found in some of the most remote, inaccessible places on the planet - the far-flung islands still governed by Britain. Ben Fogle, pursuing a childhood dream, has travelled to meet the inhabitants of these wild places with evocative names like Tristan da Cunha, Ascension, Diego Garcia and Pitcairn. Because of his own unique experience on the BBC TV "Castaway" series he's been welcomed by these isolated, patriotic communities. And along the way he's been threatened by elephant seals, chased by the Royal Navy and deported for spying, not to mention meeting Johnny Hobson. Ascension is no longer a closed island and welcomes visitors. of visitor accommodation and vehicle rental. Spelling lesson: The correct spelling is Ascension Island, however according to the web stats for this site people often search for acension, ascenion, or even ascention. Then there are the people who search for ascensionisland without a space. So maybe people are also searching for acensionisland, ascenionisland, and wondering why they don't find anything. Maths Lesson: As there is only one island, it is called Ascension Island, however the web stats tell us that the phrase "Ascension Islands" is often used. Maybe one day it will be Ascension Islands if some volcanic activity produces a new island. Meanwhile no mention of ascensionislands has shown up in the stats but it only a matter of time.